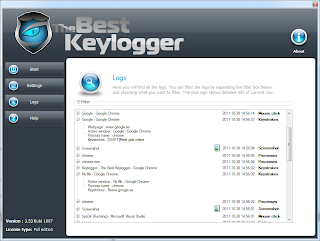 Description The Best Keylogger 3.54 Build 1001: This is Invisible Keylogger surveillance, Keystrokes Recorder, Spy Software tool that registers every activity on your PC to logs. The Keylogger allows you to secretly track all activities from all computer users and automatically receive logs to a desire e-mail. With this tool you will have TOTAL control of what is happening on your computer. Every keystroke, every website visited, every process started, every msn chat room entered and much much more that you will control from now on. The keylogger automatically activate it self when windows starts and is completely invisible. The Keylogger is not listed in System Tray, MSConfig (Startup entry), Uninstall list (Add/Remove programs) And start menu. The keylogger also Hides its files. - Log absolutely everything and send the logs to your mail. - Uncover secret user passwords and websites visited. - See everything with screenshot recording and slideshow playback. - The Best Keylogger is completely invisible and leaves no trace.